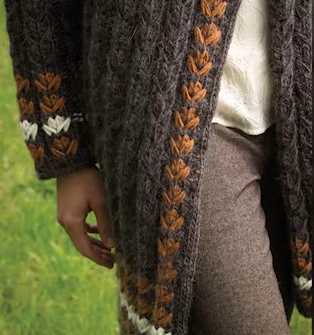 My super warm Rowan Cocoon coat design is out in the Creative Knitting Magazine September 2011 issue! Yippee! 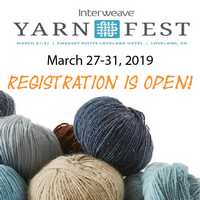 You might remember that I was playing around with all different kinds of slip stitch patterns for my final 5 piece collection (hats) for the finale of the Yarnway Project. 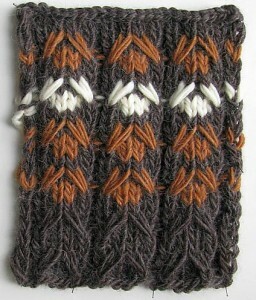 That was actually a result from exploring pattern options for super bulky and bulky yarns. I really like cables but didn’t want the bulkiness it would create with these specialty yarns. Slip stitch cables, or I like to call them “mock cables“, are a great way to give the impression of cables but without the thickness and awkward cabling of super bulky stitches. 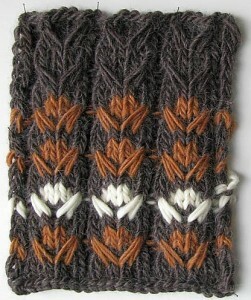 Left: Swatch is knit from the bottom up following the stitch pattern. Right: Swatch turned upside down. It definitely forced me to think the whole design through before casting on my first stitch. I couldn’t just begin at the bottom and as I was working my way up I would figure out what to do for the sleeves, neckline, etc. The coat knit up very quickly thanks to the thick yarn (Rowan Cocoon held double throughout) and the very easy and addictive slip stitch pattern (just one more flower row, and one more…). I was making good time… and then came the finishing. I should know by now that the finishing just takes time if you want to do it right. And considering that the magazine might want to show close-ups of some detail, there were no short-cuts allowed. 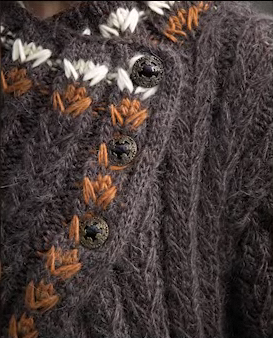 It was important to get the knitted on I-cord right and then the hunt for buttons is on. I don’t know about you, but I seem to spend a lot of time looking for the “right” button. I still have to come up with some good sources for buttons. You know, buttons that are somewhat special but won’t break your bank?